I'm a sucker for a good face mask, and I've tried many, many, face masks in my life. I love slathering beneficial ingredients on my face at the end of a long day or as a morning pick-me-up. These are my top 5 favorite face masks and what I use them for. GLOSSIER MASK DUO Okay this is technically two masks but the combination of the two is what makes this amazing. The GLOSSIER MEGA GREENS GALAXY PACK brings the detoxifying and calming role while the GLOSSIER MOISTURIZING MOON MASK is like a cozy blanket for your face, full of moisturizing super stars like sweet almond oil, plant-based squalane, and the almighty hyaluronic acid. You can start with the Mega Greens Galaxy Pack and follow it with the Moisturizing Moon Mask or do what I do- apply the Mega Greens Galaxy Pack to your troubled areas (for me it's my forehead!) and then the Moisturizing Moon Mask to the rest of your face. This combo makes this mask the perfect everyday, all occasion mask. PS: I just became a Glossier Rep, which means you can get 20% off of your first order + free shipping on orders of 2+ items by shopping with me, and I earn a tiny commission (5%). SHOP GLOSSIER HERE! 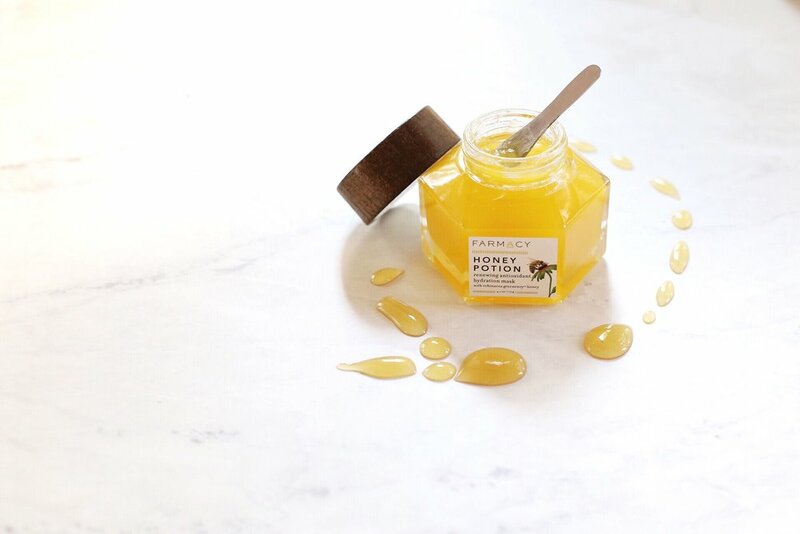 FARMACY HONEY POTION This mask is incredible and unlike anything I have ever tried before. In the jar it has the color and consistency of honey, so rich. As you rub it onto your face it turns into a warm frothy white substance. This mask leaves leaves my face glowing and hydrated. I also love that the lid is magnetic and holds the little metal spatula that comes with it making things nice and easy (you just don't need complications when trying to relax and rejuvenate you know? ).I'll be using this one a lot in the cooler months because of it's warming properties and it's hydrating effects. Heads-up for my sensitive skin friends again- I tried this once after I exfoliated, baaaaad idea. This mask does that all on its own and the warming powers can be a little much on raw sensitive skin, so don't make the same mistake I did because this mask is too worthy to be washed off before it's time. LUSH COSMETICS ROSY CHEEKS If you haven't yet treated yourself to a Lush mask before, drop everything and do it! All of their masks are preservative-free so they have a short shelf life and also require refrigeration, so you'll need to visit a Lush shop to grab one. This one is my favorite for it's calming and soothing properties and that fact that it smells like a rosy heaven. LUSH COSMETICS DON'T LOOK AT ME I think I've actually tried every face mask Lush offers, and you really can't go wrong, but I'm a gal who loves a good exfoliating scrub and this mask brings it! It reminds me a lot of my other favorite Lush product, Ocean Salt. It has ground up white rice which feels incredible on the skin when you're scrubbing it off, and lemon to brighten the skin. My face feels like a baby's bum after using this, I'm so down with that. AZTEC SECRET INDIAN HEALING CLAY And here it is, the all-mighty Aztec Secret Indian Healing Clay, pore cleansing, detoxifying and considered the "world's most powerful facial". A one pound jar of this stuff lasts FOREVER (I get it at Whole Foods but Amazon sells it as well). It comes as a powder that you mix equal parts of apple cider vinegar with (using non-metal materials as metal reacts with the clay). Brace yourself for the smell, but get excited about the outcome! It really does take my skin and own it and you literally feel your skin pulsing when it's on your face. It will leave your face a bit red, which will go away shortly after. And if you have sensitive skin leave it on 5-10 minutes only. It's also not just for your face, you can use it on insect bites, acne, your feet, it has endless powers. AFTERCARE Following every mask I apply a balm on my lips, this moisturizing serum and a rich moisturizer to help my skin recover and balance itself out (you can get 20% off of those two items by using this link to shop). It's like saying "Hey face, we had to take care of some business but just so you know, I still love you." As my body has started working harder, creating a tiny human inside of it, I’ve spent some time evaluating my sleep situation and how I can improve it. I believe that good quality sleep is one of the best ways that I can honor and reward my body and mind for the work it has endured over the day. As my bump grows, and the heartburn escalates, I know sleep will not come as easy, so I’m doing everything I can now to maximize my sleep situation. We’ve been through a variety of phases with Buddy’s sleep. I remember when he slept entirely through the night (10pm to 6am) sometime around 3 months. We were well rested (FINALLY!) and over-the-moon!! We thought we’d won the baby lotto. Well he has yet to do that again, haha. But we’ve had nights where he was up every hour, and nights where he has only woken up once plus anything in between. Sometime around 5 months we decided to stop nursing him to sleep (a terrible trap to fall into, I know). We discovered that Pat could play guitar or the ukulele and Buddy would drift off to sleep on his own and then for the most part only wake up once for a mid-night nursing. That was all fine and dandy until Pat started traveling more for work. For a moment I did consider learning the ukulele, but my lack of dexterity quickly abolished that aspiration. I needed to try something else. Enter “sleep training”. We haven’t personally believed in the philosophies of a strict sleep training program other than a few small things (like the “le pause” from Bringing Up Bebe). We have operated under the belief that when children are under a year old, they go through many phases (weaning, teething, growing, etc.) and we didn’t want to subscribe to something so ridged that we would miss listening to our own baby or ourselves. With Pat (and his precious ukulele) out of the picture though, I needed to figure out how I would get Buddy sleeping more soundly through the night on my own. I picked up The Sleep Easy Solution at the library to get some ideas. A lot of what the book outlines for a sleep training plan we were already doing: we had a sound bedtime routine, Buddy was putting himself to sleep (albeit with his daddy playing music for him but still, he was putting himself to sleep in his crib) and his sleeping situation was well thought out with black out blinds and white noise. With the guidance of this book I just made a few tweaks to our approach and within a week (like the book claims!) Buddy was sleeping better and more consistently than he ever has before- nap time included. I share this with the caveat that a little extra guidance, which aligned with things we had already been trying on our own, worked very well for our scenario. And with a sleeping baby comes sleeping parents. Hallelujah. To improve my sleep even more I decided to evaluate my bedtime routine. First, I no longer keep my phone next to my bed. I found that many nights I would climb into bed at 10pm, and without even knowing I’d be scrolling through my phone well past 11pm. Not only was this bad habit keeping me up later, but I started to consider athe last images and thoughts that would take up space in my mind before I went to sleep. Did I really want my head filled with images and thoughts about the lives of others? Rather, I am using this time to reflect on my day, and taking note of all of the gratitude I have for my life. This small thing has turned around my sleep quality and general happiness. Admittedly, I still fall into the trap of having my phone in bed or ending up in the scrolling world on my iPad but I’m slowly trying to push this habit entirely out of my life. Second, I am trying to make bedtime an even cozier ritual. I pulled out my essential oil diffuser again and started diffusing my favorite sleep oils, like lavender, bergamot and pine. Sometimes, if I am thinking of it, I bring a warm mug of tea to bed and sip slowly on that to calm my body. I also keep a selection of books to read on hand as well and light a candle to comfort me while I read. Little things like this make going to bed something I am excited about and help my body prepare for a restful night ahead. We recently upgraded our scratchy old sheets; awkward sized comforter (that was too short for our feet), and flat pillows and I can’t believe what a difference it has made in our quality of sleep. I’ve been pretty stubborn about investing in quality bedding but now I am a full-believer that you get what you pay for. Our new bed sheets by Tomorrow Sleep are so dreamy, like butter! They stay nice and cool- which is great when you share a bed with a very warm-bodied man. Throw in a fluffy new set of pillows and a comforter that replicates (what I would imagine) the closest scenario to sleeping on a cloud and tuck me in! I highly recommend investigating your sleeping situation, from your mattress, to your comforter and everything in between if you are looking to improve your quality of sleep. Tomorrow Sleep is offering $100 off of a $500 purchase if you are in the market for your own personal cloud to sleep on too. Just click this link and use the code: VIKLUND100 (expires 12/31/17) for $100 off any $500 order. What’s keeping you from great sleep? Is it a physical thing or an emotional blockage? If we spend 7-8 hours a night in our beds, shouldn’t we do everything we can to ensure that we are honoring our body and the work it does for us all day? From the physical demands, to the emotional ones? When I was in 6th grade I decided to apply glitter gel to my face before bed. I woke up with an insane rash & quickly learned that skin does need to be cared for, in the right way (sorry glitter, your purpose is served elsewhere). Though I didn't know it at the time, this was the beginning of my skincare journey. My routine has evolved with the needs of my skin over the past few decades. It began with a simple warm washcloth wiped over my face in my pre-makeup years to where I am now as a 30-year-old thinking about hydration, wrinkles & supplementing (assisting?) the youthful glow. These are the products I have tried, tested, & chosen to keep around & use in my evening routine which - *spoiler alert* - does not involve glitter. Glossier Milky Jelly Cleanser. A cleanser that gently removes makeup & moisturizes skin is hard to find, but this one fits the bill. I have tried a lot of cleansers & many have fallen short in their ability to actually take off makeup or if they do, they are very drying. I love that I can rub this stuff straight onto my lashes to remove mascara & it doesn’t irritate my sensitive eyes. It’s also worth mentioning that the scent of this cleanser is delightful. PS: You can get 20% off your first Glossier order & free shipping on orders of 2+ items with this link (this link is unique to me as I am a Glossier rep, because I love their products so much). Thayers Alcohol-free Rose Petal Witch Hazel with Aloe Vera. My commitment to using this product runs deep. I splash a bit of this onto a cotton round & run it along my face after washing. I’m always surprised by the dirt & makeup that still lift off with this (even after a shower). If you're not into roses as much as I am (more here) just be sure to go for the alcohol-free variety (which even includes a lavender option), it won't dry out your skin. I use this before applying my moisturizer & because of the aloe vera in it I don’t need to use much moisturizer at all (so if you use a high-end, fancy pants lotion you will get more bang for your buck). Glossier Super Glow. After about a month of using this serum every night (& day), I am officially a super fa of the brightening benefits of this serum. This is the newest addition to my nighttime routine & I don’t see it going away anytime soon plus, the price is a steal for the glow it gives my skin. Glossier also offers serums for hydration & redness/breakouts. I add a drop to my forehead & cheeks & rub it all over before moisturizing. PS: You can get 20% off your first Glossier order & free shipping on orders of 2+ items with this link (this link is unique to me as I am a Glossier rep, because I love their products so much). Farmacy Sleep Tight Firming Night Balm. This gem came to me by way of a Pop Sugar Must Have Box (back when I was still a subscriber, #budgets). Out of all of the skincare products that came my way over the years as a subscriber, this is the only one I actually used religiously & intend to repurchase. I 100% believe this has minimized fines lines & made my skin more firm. The consistency is a gel-like oil- hard to describe, but it’s lightweight & very hydrating. This is also the type of product where a little goes a looooong way so a jar can last a while. If I have a breakout on my forehead I just apply this to my cheeks, chin & neck and use a blemish product on my forehead instead. Fountain of Youth Skincare Rewind Eye Cream. I was introduced to Fountain of Youth Skincare when they contracted my photography services & have since fallen in LOVE with their products. This eye cream fades dark circles & works to erase fine lines. I apply it on top of the Farmacy balm for extra hydration & lift (trust me, I need it). I use a very small amount & dab it around my eyes & around my brow bone. I even apply an additional layer when I get up to use the bathroom in the middle of the night. If there is any skincare product that’s worth investing in, in my opinion, it’s a good nighttime moisturizer (see above) & a good eye cream. Smith’s Minted Rosebud Lip Balm. Two things I cannot go to sleep without doing: emptying my bladder (thank you pregnancy) & applying balm to my lips. This balm has been in my toolkit since my high school days. It combines the beautiful smell of roses (yeah, rose scent is a thing for me) with the cooling effect of mint. It’s the perfect amount of moisture for my lips. I apply it every night and yearn for it when my lips are chapped. The only downside is that it is hella-hard to pull the tin lid off if you have just put lotion on your hands- so keep that in mind. Oh, and if you leave it in your car on a warm summer day make sure it is laying flat & that it re-solidifies before you move it. I have it in my plans to create more beauty posts (skincare, makeup, the like!) in the future, so please let me know what you think or if you have any favorite skincare goodies you get excited about.